This USB-C docking station for MacBook and Windows laptops takes productivity to a whole new level, with support for triple 4K monitors - a first in the market. The triple 4K docking station supports Ultra HD 4K resolution on two DisplayPort monitors (at 60Hz), and on one HDMI monitor (at 30Hz). The docking station also features 60W USB Power Delivery 2.0, so you can power and charge your MacBook or Windows-based USB-C or Thunderbolt 3 laptop as you work while powering your peripherals, using the included 120W power adapter. Through just one USB Type-C cable, the dock also provides access to a wired network and five USB ports. It’s a must-have accessory for your MacBook Pro, Chromebook Pixel, Dell™ XPS 15, or other USB-C enabled laptop. The dock can also be connected to a USB-A port on laptops (using a USB-C to A cable, sold separately), but only dual display is supported, and Power Delivery to charge your laptop is not available through USB-A. This premium docking station lets you create a multi-monitor Ultra HD workstation with three monitors, even if your laptop video card doesn't natively support it. The USB-C dock offers a fast and easy way to maximize your laptop's workable screen space, giving you four screens in total when coupled with your laptop's display. For high resolution, graphic-intensive applications, the dock can also be used to connect a 5K display (5120 x 2880 resolution) at 60Hz, by connecting the two DisplayPort video ports to a single 5K display. You can set up a single 5K display or create a dual-monitor workstation, with one 5K display and one 4K HDMI display. 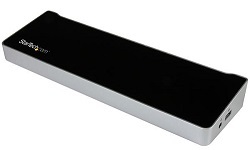 Compatible with both Windows and MacBook computers, this universal laptop dock works with many USB-C enabled laptops. You simply connect to your laptop’s USB-C port to get up and running quickly. Because the dock uses USB-C, the dock is Thunderbolt 3 port compatible, you can connect it to your Thunderbolt 3 equipped laptop. For the MacBook Pro, this docking station provides a strong alternative to Thunderbolt 3 docks, to meet your charging needs and high-quality display requirements. A high quality fully rated USB cable with the A-B Male to Male type connection. Attaches to the male plug on a Type-A device or cable, so you can connect to the USB Type-C port on your smartphone, tablet, Ultrabook or computer.